Adaptive Streaming: Cloud, Gateway, or Both? Adaptive streaming is the process of slicing a digital video file into different sizes: Maybe one that’s two seconds in length, another that’s four seconds, and so on. The technique necessarily works hand-in-hand with “trans-coding” and “trans-rating,” which match available bandwidth with video stream size. Less bandwidth, stream the smaller file; more bandwidth, stream the bigger file. Why: When one is bandwidth-constrained, which can happen when squishing a linear, multichannel HDTV product over DSL networks, it’s good to have adaptive streaming at hand. Which isn’t to say that adaptive streaming is just an AT&T thing. It’s attractive to anybody with a network that’s staggering under that pesky 45% growth rate of video, as a percentage of IP traffic. That means cable, mobile, and telco networks. Which brings us back to you, Jan. Where does adaptive streaming happen, gateway or cloud? The answer is … yes. Turns out, parts of adaptive streaming can happen in both places. Some cable technologists say the headend is the place to right-size streams to suit the care-and-feeding requirements of the end displays – tablets, PCs, laptops, things that connect through the cable modem, not the set-top box. Slice, authenticate, and secure video streams there. Other technologists submit that the gateway or “hybrid box” (half cable modem, half set-top box) could be the place to do transcoding. In that case, it’s not so much about sizing the stream for the screen, based on available bandwidth. It’s more about making it so that any of your screens can play any of your digital video archives. Maybe some titles you own were compressed with the older stuff of MPEG-2. Maybe some of your screens only know how to decompress the newer stuff of MPEG-4/H.264, or vice versa. That’s when you’d consider putting transcoding activities there. Plus, silicon is simultaneously growing in capabilities, while shrinking in size. The gates on the chips are there (or will be), to support the heavy processing requirements of trans-coding. Which is good, because there’s an h.265 compression method on the drawing boards, and the 2012 Consumer Electronics Show is likely to show fresh examples of “4K” video – the next size up in picture resolution, from today’s 1080p HDTV. Anyway: Gateway or cloud? Yes. Both. So far. When I had Comcast service — back before my sister and I moved to the farm, where DSL is the only option — I don’t think I ever used my set-top remote for text entry. I never had to set up my own box, and the idea of searching for what I wanted to watch was comical. Besides, I had most of my favorite channel numbers memorized, and the VOD selection was all in one place and easy enough to browse by channel. Streaming devices are a different story altogether. I find myself using the search feature more often — there’s a lot of content out there, and most of it is organized by cover art. While the cover art makes for a much nicer user interface indeed, it can take significantly longer to browse than a grid guide. You’ll also be setting up your own box, which means at a minimum entering a wireless password, and probably a handful of passwords for streaming services like Netflix and Hulu. Depending on the method of text entry, setup can either be a breeze or a multi-hour ordeal that has you ready to ship the offending device back to its manufacturer. In other words, a great device can be spoiled by a bad text entry experience. Fortunately, most manufacturers now allow you to download remote control apps for iOS and Android which are often a much more elegant solution. Which brings me to a question: Whither the fate of the physical remote? Click below for highlights of the text entry experience on some of our devices, I’ve summarized each device after the video. Apple TV offers the simplest remote, but the most elegant onscreen keyboard. The cursor is very quick to respond to the remote, and you can easily scroll through the letters by holding down the directional buttons without overshooting. One very nice feature is the ability to quickly toggle between keyboards (letter, number, symbol) by pressing the play/pause button. iOS and Android remotes are also available. The Boxee Box takes it a step further by including a full QWERTY keyboard on the back of the remote. This works very well, with two exceptions: the letters are difficult to see in a dark living room, and it’s easy to accidentally press the buttons on the other side of the remote. Boxee also has iOS and Android apps, including an iPad app that works both as a media server and a remote control. Roku’s onscreen keyboard is quite clunky and slow to respond, especially when attempting to scroll over to a letter on the other side of the screen. It’s also difficult to switch between different keyboards, so entering passwords is very time-consuming. One thing about Roku is that for most services you’re not actually required to enter your password using the onscreen keyboard. Instead, a message directs you to visit a URL and enter a 5-digit token code to link your account to your streaming player. It does require another device, but I rarely watch TV without a smartphone or laptop nearby. GoogleTV remotes are often criticized for their complexity, but they are great for text entry. 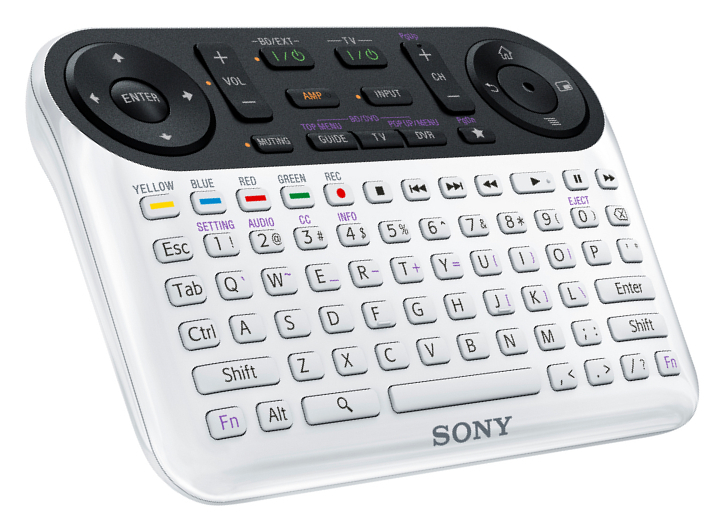 The Sony remote features a full QWERTY keyboard, and the Logitech device comes with a full-size wireless keyboard. 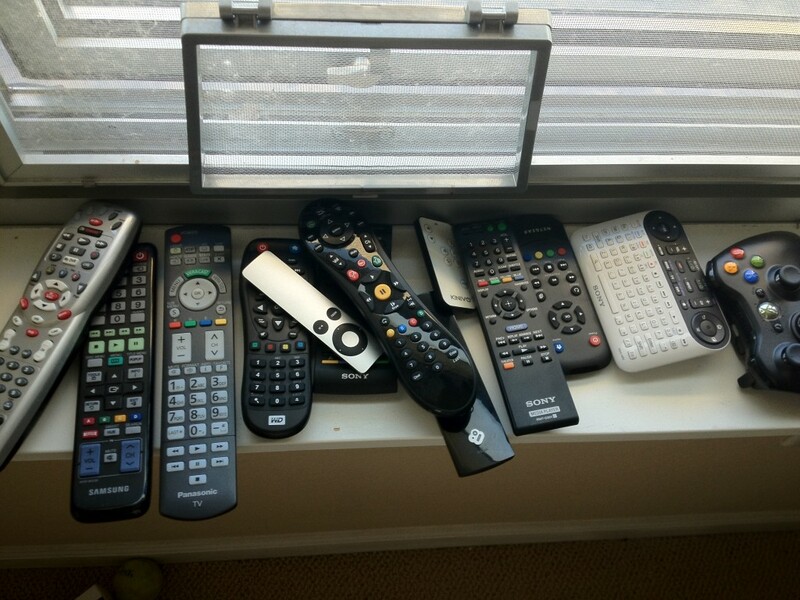 There are iOS and Android remote control apps also, but they are almost as cluttered as the physical remote. The controller doesn’t make for easy text entry — it’s difficult to scroll using the joystick controller — but the voice recognition features of the Kinect camera may make content searches a breeze in the future. You’ve also got the option of plugging in a USB keyboard for text entry. TiVo offers a unique solution to the text entry problem: It sells a $50 remote, called the TiVo Slide, which opens up to reveal a full QWERTY keyboard. This is a nice option for text entry, but if like most people you already have too many remotes, it’s a tough sell — especially since there are free apps for iOS and Android devices. This is another one of those devices where a smartphone remote app really saves the day. The flimsy remote control makes text entry even more tedious, each button press requires a substantial amount of effort. I’ve saved the worst for last here. The virtual keyboard on Sony’s new device is smaller than it needs to be, and is laid out in a T9 format with the letters spread out across ten number keys — completely unchanged from last year’s N100, except that the numerical keypad was removed from the physical remote so now it makes even less sense. The letters on screen are small and hard to see, and they are interspersed with numbers, which only adds to the confusion. To switch case or add a symbol, you have to scroll to the bottom and switch keyboards. In other words, a text entry nightmare. 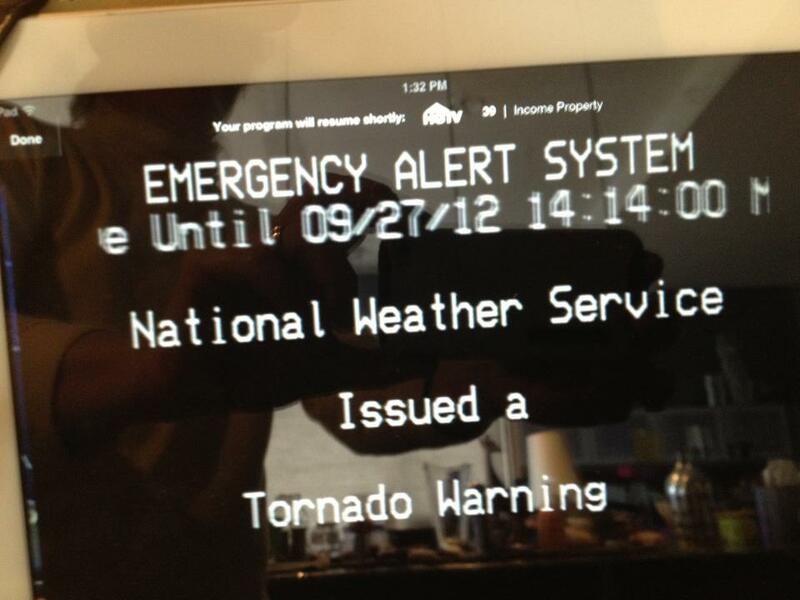 Here’s one you may not have heard about: On Nov. 9, at 2P Eastern, anyone anywhere in the U.S. who’s sitting around watching TV will witness a test, just a test, of the national emergency alert system. So, just like the local EAS tests conducted monthly, but nationally. Everybody, all at once, same message. The reasoning behind it is grim, but logical: What if the President needs to get an emergency message out to as many people as possible, with or without a live Internet? Answer: Send it to the TV. That’s the reasoning, devised by the U.S. Department of Homeland Security, the Federal Emergency Management Agency (FEMA), the Federal Communications Commission (FCC) and the National Weather Service. The test is a first, over a system was never yet activated to be hierarchical. Only local. And, as it turns out, the technology required for the effort isn’t exactly a no brainer. First of all, it’s not like someone is sitting at a console, over at headquarters for FEMA, Homeland Security, or the FCC, saying “ok, Freddy, type this in.” There’s no hitting SEND, and distributing a message live, to every TV set in the land. No, the message itself, and for the purposes of the test, is to be hard-coded into the existing gear that handles local and state emergencies. In a cable sense, that means gear in headends, listening for the EAS trigger, then force-tuning all set-tops to a channel. Thing is, the verbiage of the visual message doesn’t exactly say it’s a test. The audio does, yes. The text? Not so much. And it’s too close to the test to change it now. Um. What if the sound is off, or the ears not working right? Seems likely that someone, somewhere, will see the alert – “this is a national emergency,” or some such — but not hear that it’s just a test. People flipping out, as a consequence, seems plausible, if not likely. Meanwhile, work continues within an outfit called EAS-CAP (www.eas-cap.org), where the “CAP” stands for “Common Alerting Protocol.” Its tagline is “promoting standards for the next generation of EAS.” The FCC in September extended manufacturer compliance with EAS-CAP specs until June of 2012, from Sept. 30, 2011. So, if there’s a next generation of EAS coming by next summer, maybe hold off on the test until then, instead of freaking people out? Just a thought. Looking at the description for the Sony SMP-N200 (SMP stands for “Streaming Media Player”), it appears to be the ultimate streaming device: It supports DLNA streaming, but also has access to all of the major services: Netflix, Hulu, Amazon, Vudu, YouTube, Crackle, etc. — all for about the same price as the Roku 2 XS. Unfortunately, a counterintuitive user experience and limited file support overshadow the many good qualities of this device. The SMP-N200 has a lot of the same functionality as last year’s device, the SMP-N100, but comes in a prettier package. It has a smaller footprint, and the utilitarian design of the N100 has been replaced with a sleek metallic top and curved sides. 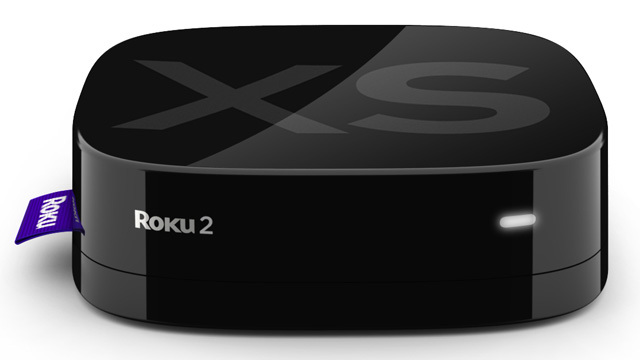 It’s still on the large side — about 4 times the size of a Roku 2. They’ve also done a nice job overhauling the remote, in that it’s lost the old generic remote control look, in favor of a smaller size and flat plastic keys. It fits the hand well. My hand, anyway. When I fired up the device, I was greeted by the same old XMB interface that was on the last one (XMB stands for “XrossMediaBar”, Sony developed this interface for the PSX back in 2003 and it hasn’t changed much). This interface is fine for game consoles, but doesn’t work so well for a dedicated streaming device — all the video sources are organized under a single menu, and there are a lot of sources clogging the list that probably won’t be useful to most people. The Sony media players are also the most memorable devices I have set up, and not in a good way. For starters, Sony has once again chosen to go with a T9 layout for the onscreen keyboard. This was mind-boggling enough on the previous device, but now that the remote control has lost its number pad even those of use with residual T9 texting skills are out of luck. 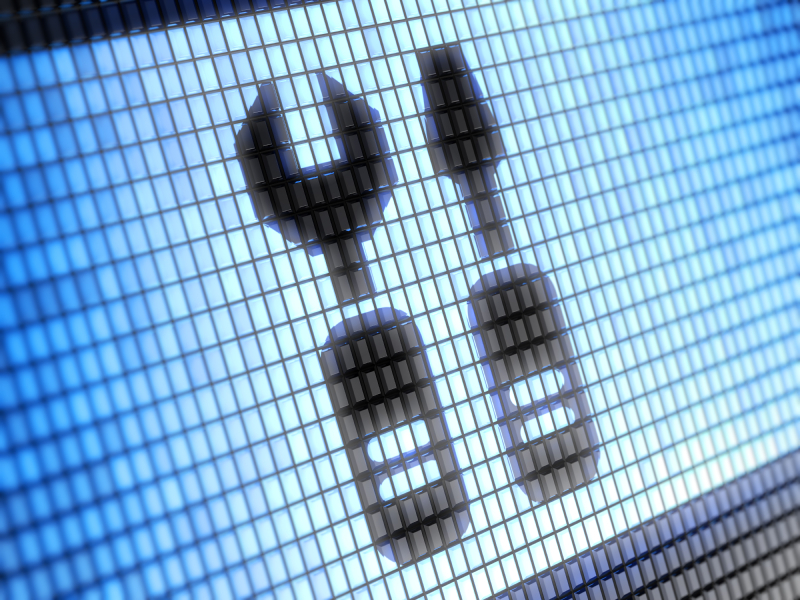 Setting up the services was another headache. In order to sign in to Amazon Instant Video, I first had to register for Sony Bravia service, then retrieve a code from the “Enhanced Features” menu in my network settings, to enter into Sony’s website. If this box is designed to stream video, can that really be called an enhanced feature? Fortunately Hulu and Netflix were a little more straightforward — I had the option of either entering my password using the onscreen keyboard (no thanks), or entering a 5-digit code into a web browser. Sony also designed its own interfaces for services like Netflix and Hulu, and in the process made the user experience a lot worse. They reduced the size of the cover art so that it’s barely readable, but there aren’t any more titles on the screen at once than you’d see on a Boxee, for instance — it’s all just empty space. They also removed the ability to jump to a certain letter when browsing genres in Hulu, and for some reason renamed Hulu’s “Genres” menu to “Channels.” I found this to be very confusing alongside “Networks” in the main menu. The standard UIs for Netflix and Hulu are so much easier to use, I found myself wondering why Sony spent the time developing their own in the first place. The SMP devices are also DLNA-certified, which is rare for a device that runs in the $99 price range. For people who own a lot of digital content, this is often a bigger consideration than a slick user interface or ease of setup. The box does a great job of finding my network drives, but the files were hard to navigate and I had a hard time getting anything to play — even MP3 and MP4 files, which should be supported, came up as being unreadable or corrupted (though the Boxee Box recognized the same files without issue). 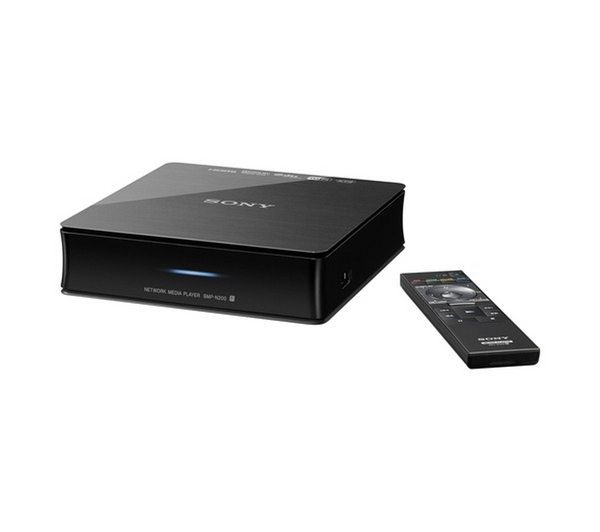 The Sony SMP-N200 packs a lot of important features and services into a sleek little box, and for a reasonable price. The device is quick and responsive, and it feels well made. With more robust file support and a better user interface, the SMP-N200 could really give the other devices a run for their money. But I think Sony will need to engage in a lot of user testing in order for that to happen. 1. 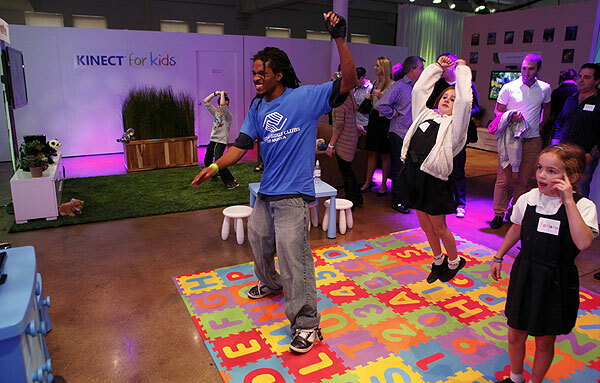 Microsoft launched a new “playful learning” initiative, in cooperation with Sesame Workshop, National Geographic and various learning institutions. Downloadable, linear episodes will allow children and families to interact with the characters, don virtual costumes and explore the environment on-screen. Kinect is filming interactive versions of current Sesame Street episodes and will also provide access to classic clips from the show’s archive. A series of interactive children’s books is also in the works. We can’t WAIT to check this out. Availability uncertain; we’ll keep you posted. Read more at the official Microsoft blog. “Fail quickly.” On driving home from the airport recently, I tuned into the middle of a show on BBC. In it, four delightfully British people were talking about the advantages of the Internet for startups. Four times, one of the top-3 reasons stated was the ability to fail quickly: Think it up, put it up, see if people like it. If they don’t, take it down. Gather lessons learned, dissolve, move on. Example: You want to open a store. In the old world, that meant finding space, then signing a year’s lease. Online? Try it out. If it doesn’t work, take it down. Fail quickly. This is all great, unless you’d just spent cash money on the product or service. Or you really liked the thing that failed quickly. In the rolling transition to “all things IP” (Internet Protocol), one benefit comes up a lot: Service velocity. Launch new services more quickly. Say goodbye to the dreary muck that is hooking into back office systems that grew up in the proprietary-heavy past. Keep content fresh. Add new features in eight weeks, not 18 months. Service velocity is everything you’ve seen happen with “the guide,” all tightened up, studded with graphics, and available in ways that aren’t constrained to the remote control: On an iPad, on your smart phone. Here’s how people talk about it, culled from an ever-growing batch of notes on the topic of The Big IP Transition: “Development cycles are getting shorter and shorter. For set-tops, we have about 300 developers and quality assurance (QA) people who do nothing but set-top box software. With those 300 people we put out a total release of the guide about every 18 months. That was Comcast CTO Tony Werner, talking to a Canadian audience earlier this year about service velocity. Another part of it, he noted, is the back office. “Five, six years ago, we started to stand up all the back-end systems into web services.” Goodbye, huge internal integrations; hello, web-based interfaces to practically everything. Hello, cloud. Service velocity is important, for obvious reasons. Cloud gets you there. So far, the only obvious examples of “fail quickly” in the video world are those apps, usually not related to video, getting taken down from connected TVs. 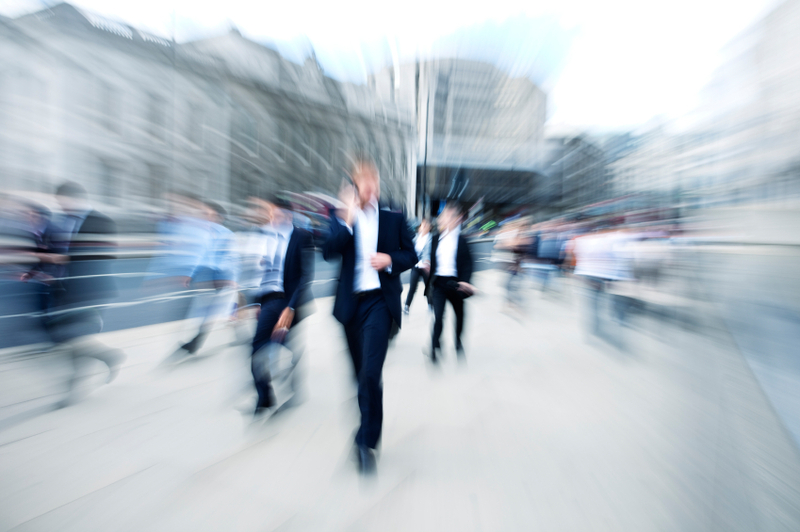 Failing quickly, as a byproduct of service velocity, is inevitable. All I ask is this: When you decide something’s a failure, think about how to treat those people who really like it, or who just spent hard-earned cash on it. Give us an alternative to reluctantly try. We thank you in advance. Nothing like teaching a class about the transition to everything over IP (Internet Protocol) to keep you on your toes, translation-wise. What’s top of mind about IP in a classroom full of cable people, at this moment in time? For starters, that skinny little upstream path, and whether Comcast doing something different with theirs, given their work on video-Skyping via the TV. And, my personal favorite, because it’s easiest to answer: What is VoLTE? Last one first: VoLTE stands for “Voice over Long Term Evolution,” where “LTE” is that get-funky mobile euphemism for wireless broadband. LTE was developed for broadband, and as such is oriented for IP-based data services. So, putting voice over LTE isn’t as no-brainer as you’d think, even though mobile as an industry grew up on voice as its bread-and-butter. As for Comcast’s upstream signal boundaries: They’re no different than the rest of the industry. A mean little swish of spectrum located between 5-42 MHz. Operators historically and deliberately haven’t attempted to stuff video upstream. Simple reason: Not enough room. 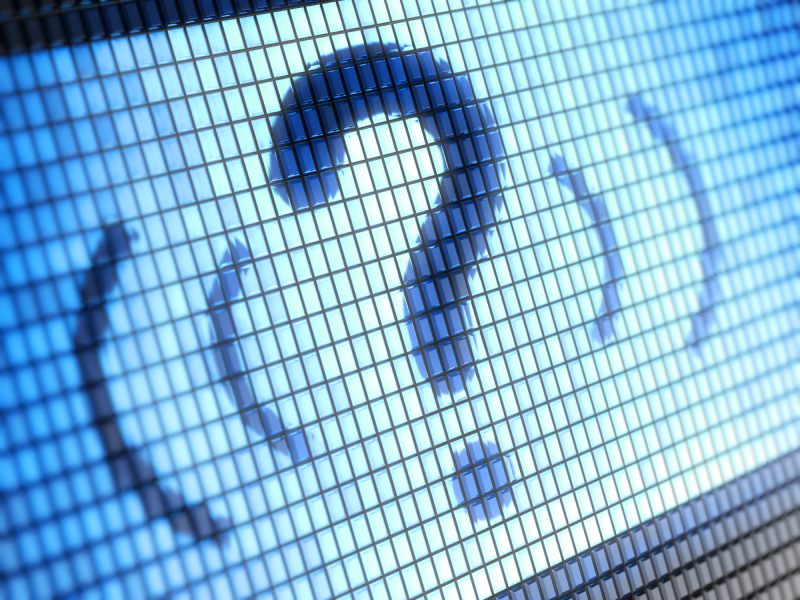 Will the blobbish-ness of video-Skyping clog it up? According to the engine-room talent working on it, there are two things to keep in mind here. First, there’s a beginning and an end to a phone call. Unlike TV, you don’t usually just the phone on/open, when you’ve said goodbye. Two, the signaling and codecs involved are designed to be mindful of bandwidth. Meaning, Skype in the upstream is not like that swell surveillance camera on sale from Acme Camera, which only does full-motion JPEG at 5.5 Mbps upstream (because it’s cheaper! And bandwidth is free!). About the cloud, and what all goes up there: Maybe not everything, but close. Remember that cable innately is a cloud – an intelligent network that relays entertainment, information and communications back and forth to homes. Watch for cloud storage (think network DVR), and cloud guide (think iPad app), and the business logic and databases of “the back office,” in the cloud. Identity management, parental controls. Voice mail and email already sit in the cloud, for the most part. We are entering the kitchen sink phase, friends, for clouds and gateways. This is a transition. A marriage of households. Which means for some period of time, you’ll either need two of everything, or have three of the thing you don’t need. Hi, and welcome to our Over-the-Top lab! I’m Sara, and I’ll be here every week to discuss all things related to streaming video — from comparisons of the latest devices to explanations of the underlying technology. Consider this a visual sort of “Translation-Please,” for services and devices that stream video over IP. I became a cord-cutter a little over a year ago, out of necessity. I moved to a rural neighborhood and found out that I couldn’t move our Comcast service to the new house. Armed with a Sony PS-3, a Netflix streaming disc, and an extremely slow DSL connection, I started my adventure and quickly found a new hobby – trying every streaming player I could get my hands on. There are so many devices and services on the market today that it’s nearly impossible to keep them all straight, especially without having them all set up side by side. Our intent is to observe how well each works (or not!) and how they stack up against one another. Also to see what would and wouldn’t compel consumers to cut the cord, and/or to go to the “connected” input of smartTVs, tablets, smartphones, and on and on. We especially want to hear what you — yes you, you, reading this right now — are most interested in. Please drop me a line (OTTlab@saradirkse.com) if there’s a device you’d like to see us review, a burning question you want answered, or if you’d like to schedule any tests for the lab. And thanks for reading! Spanning six chapters and 209 pages, the book is a vivid, navigable read. Tons of photos, including one of the napkin drawing that inspired the build of what we now know as the Road Runner broadband service. Prefer video? Hover that iPad over any of a dozen QR (quick response) tags, to watch related video snippets. 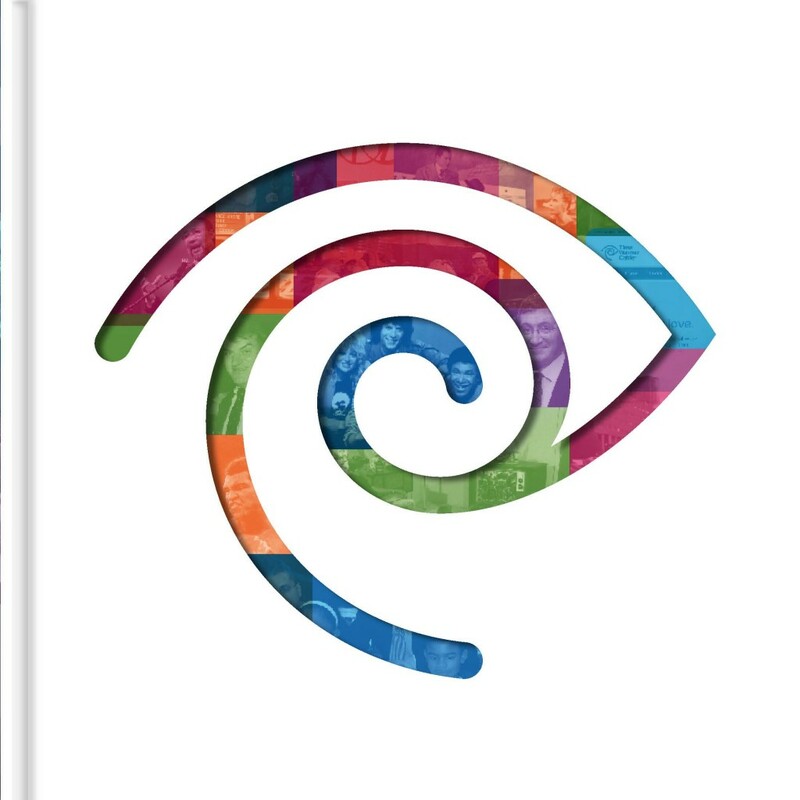 Historically, Making Connections covers all the big milestones – the beginnings of satellite delivery, the franchise wars, the regulatory setbacks, QUBE, video over fiber, the “summer of love” that begat the industry’s consolidation, in the early ‘90s. Digital video, video on demand, broadband. Beyond that, there’s confidential strategy reports, colorful characters (Bill Daniels, June Travis, Steve Ross, Fred Dressler) and lots of lesser known fare. Example: HBO’s “Thrilla In Manilla” always gets first mention when discussing the earliest days of satellite, but did you know that the first original program on HBO was the 1973 Pennsylvania Polka Festival? Or that the company’s earliest marketing honchos came in droves – from Avon? Likewise for the tale about Time Warner technologist Mike Hayashi, whose cell phone rang at the 2000 Consumer Electronics Show – a call for then-CEO Joe Collins. “Joe, this call is for you,” Hayashi said, handing him his phone. “Collins paused. ‘Oh really?’ he said into the phone. He ended the call … and immediately returned to New York,” having just learned of the company’s merger with AOL. The book teems with candor, about that decision (“It wasn’t clear that there was any there there” – Jim Chiddix), and the frugality of the company: “Don’t spend a nickel extra” (about Monte Rifkin); a lavish getting-to-know-you luncheon thrown at a country club in Columbus for (then-new) Collins. He glanced at the menu and asked instead for a hamburger. At times, Making Connections is a little inside-baseball. The ending chapter is a tad light on the “where we’re going” — but overall it’s a meticulously researched and entertaining encapsulation of the MSO’s and the industry’s technological and business accomplishments, over six decades.